There are more than 1500 kinds of fish that live in the Great Barrier Reef. 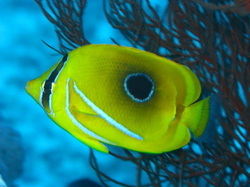 Some may include the Butterfly Fish, Angel Fish, Clown fish, Trigger Fish, Sharks, Coral Trout, and many more. 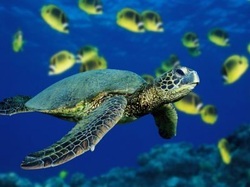 Six species of Sea Turtle are found in the Great Barrier Reef. They are the Green, Loggerhead, Leatherback, Hawksbill, Olive Ridley, and Flatback. There are many different species of Mollusc. Some include giant clams, Squid, Cuttlefish, and Octopus. There are over 5,000 species of Molluscs in the Great Barrier Reef. There are 400 different species of coral in the Great Barrier Reef. 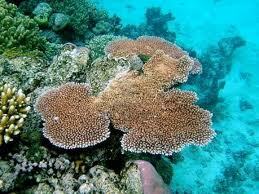 Coral is made of small organisms called Coral Polyps. There are Hard Coral Polyps and Soft Coral Polyps. The Great Barrier Reef has 1/3 of the worlds soft coral. There are 15 species of Sea Grass in the Great Barrier Reef. Sea grass is very important to this biome because it is food to many organisms, including the Sea Turtle.